Two of Nickelodeon's biggest titles are heading to Netflix with new, original movies. 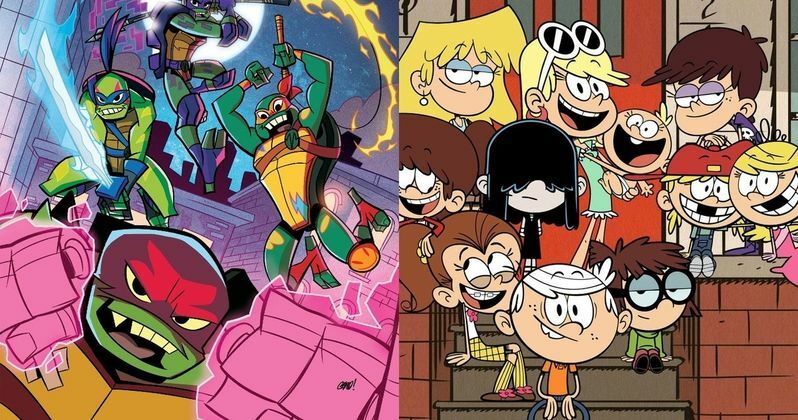 It's been announced that the network will produce movies for the streaming service based on animated series Rise of the Teenage Mutant Ninja Turtles and Loud House. This comes as part of a larger, multi-picture deal made between Paramount Pictures and Netflix late last year. According to a new report, Viacom CEO Bob Bakish confirmed the news during a recent analyst call. Viacom is the parent company to both Paramount and Nickelodeon. This expands the scope of the company's dealings with Netflix, as they already produce the series Pinky Malinky, as well as the highly-anticipated upcoming live-action series based on Avatar: The Last Airbender. It was made clear that both of these projects were movies, not TV shows, that they hope will help promote the brands overall. Bakish had this to say about it. "This is both incremental business and powerful promotion for these two franchises." Rise of the Teenage Mutant Ninja Turtles debuted on Nickelodeon last year and brought the heroes in a half-shell back to the world of 2D animation. Many fans originally discovered the Turtles through the 80s animated series, which means when the movie eventually lands on Netflix, not only will younger viewers tune in, but adults who may be feeling nostalgic will likely give it a click. The core cast for the series includes Omar Miller as Raphael, Ben Schwartz as Leonardo, Josh Brener as Donatello, Brandon Mychal Smith as Michelangelo, Kat Graham as April O'Neil and Eric Bauza as Splinter. The expectation is that they would all be on board for the movie. This also could help fill the void while Paramount gets their live-action reboot of the TMNT franchise going, following the failure of 2016's Teenage Mutant Ninja Turtles: Out of the Shadows. As for The Loud House, which comes from creator Chris Savino, it's gone on to become one of Nickelodeon's most successful shows, now in its third season. It's second to only to the long-running Spongebob Squarepants and even has a spin-off coming down the pipeline in the form of The Casagrandes. The show centers on a boy named Lincoln Loud who grows up with his ten sisters. Paramount originally had a movie based on The Loud House set for release theatrically in 2020, but that has since been removed from their schedule, no doubt as a result of this deal with Netflix. At the present time, no plot details have been revealed for either project, nor is it clear who is going to be directing the respective movies. It also hasn't been revealed when either movie will actually debut on the streaming service, but 2020 doesn't seem unrealistic, given that The Loud House was originally supposed to hit theaters next year. This news was previously reported by The Hollywood Reporter.